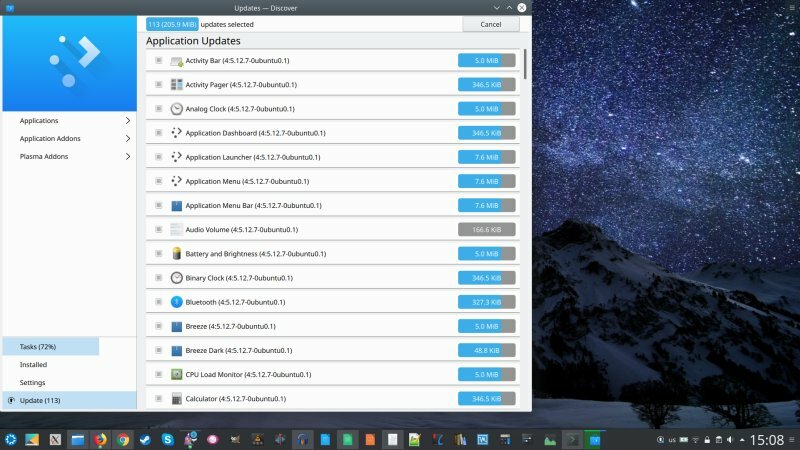 Over the past few weeks, Kubuntu 18.04 seems to have settled even more. Updates aren't that frequent, so there isn't that much disruption to my work flow. Discover is doing a better job, reacting ever so slightly faster than before. There aren't any odd lockups or weird behavior. Might become a respectable denizen of the net one day. Old bugs are slowly going away. In particular, the baddies I mentioned in report 4 have largely been resolved. Most notably, the Chrome panel icon issues are almost gone. Updates no longer break the scaling, and the icon displacement is less common than before. Almost not there, but then occasionally, the icon will jump out of its pinned location to the right end of the panel. The system is stable. I didn't have any crashes, and it's been many a week since I had to restart the Plasma shell for any which reason. I didn't have to do fiddle with kwin, either. So I guess the bugs are being ironed out, which is how it should be. 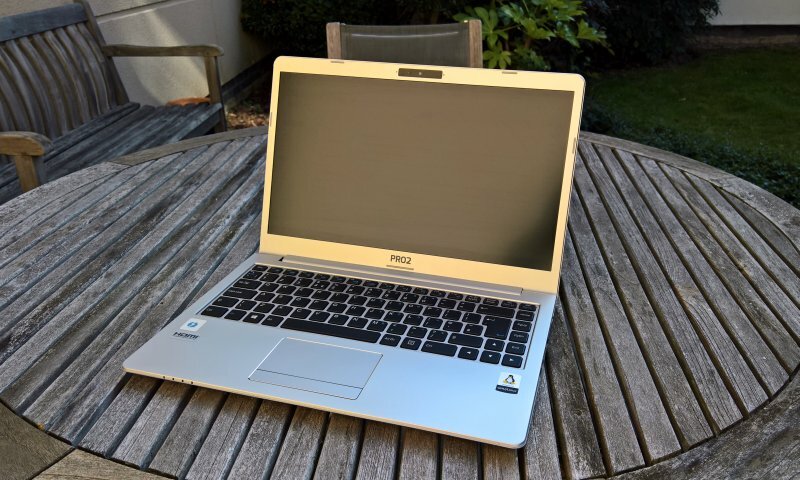 When writing this article, LibreOffice was at revision 6.1. There are some important visual and ergonomic improvements in this version, most notably the Office-like ribbon layout. It's still listed under experimental features, but there's more order and logic in the presentation layer. Easier to find and manipulate. 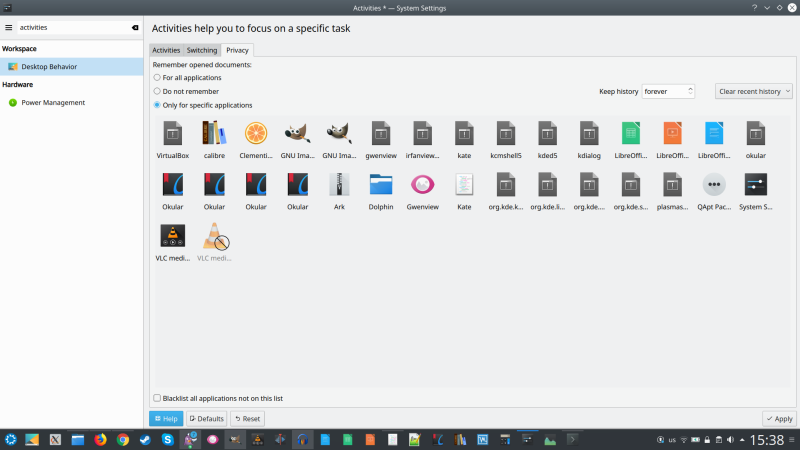 The icons and functions are better organized. Some performance boost, too. Yes, I'm aware that version 6.2 is out, and I did indeed review it. But this was before. Only posted after. Geddit? However, while I do like LibreOffice a lot, and I use it for writing drafts of books and stories, the final editing and collaborative work with agents and publishers and whatever always goes through Microsoft Office. It's not just compatibility, it's also the productivity. Microsoft Office is faster to use, because it has a more logical and efficient layout. Just take styles for example. You don't have a short list of commonly/recently used styles so you can quickly apply them with a single click. Instead you need to waste clicks on selecting and applying, every single time. Then, in the sidebar, the styles view jumps to the current style so if you're applying something that's outside the existing view section, you need to scroll up and down, wasting still more clicks and time. Double-click to apply, too. Microsoft Office does this with one click, a static view on last used style rather than current selection, and a short list of recent styles, all of which make work much faster. This went well. Seamless. I happened to be in an office, I hooked the HDMI cable in, and within a second, there it was, the Plasma desktop showing on the wall. It was the standard Plasma wallpaper, sans any decorations, panels and icons. This ain't bad, because you don't immediately project your active desktop. I could drag windows onto the second screen and everything. 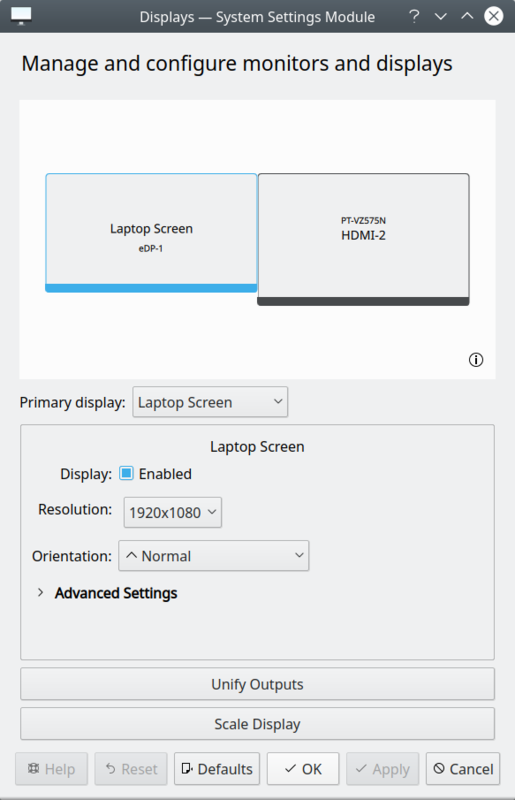 Of course, you also have the option to unify screens and whatnot. I tried all the different permutations, and it was all clockwork. This wouldn't be an issue - at all - if Plasma didn't tout the concept of Activities and privacy tracking. But since it does, I decided to try the functionality. Notably, you can tell the system not to track certain applications, and even create supposedly private Activities where nothing is tracked. On paper, this sounds good, and if you combine this with Vault, then you have a private, isolated bubble on your box without having to resort to dual-booting, virtual machines or excessive scrubbing of recently opened documents and such. But this didn't really work as expected. I created a new 'private' Activity and then played a few media files inside. Back in the default desktop, I had the files listed in VLC under Recently opened, plus searching for these files via the system search menu, they all showed, with their path in Vault, e.g. ~/Vaults/whatever.avi. 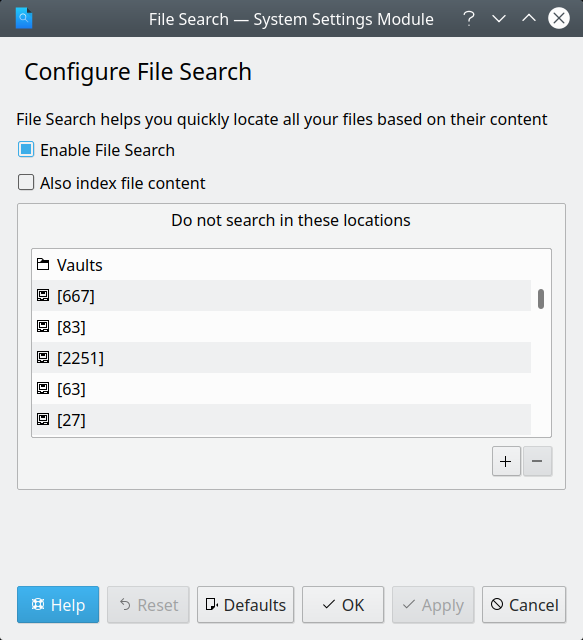 I tried to change the File search settings and search bar, and explicitly added Vaults as a location that shouldn't be indexed. Nope. I dismounted one of the Vaults, let the system be for a while and checked what the search returns, and it still showed the files that are supposed to be hidden inside the Vault. 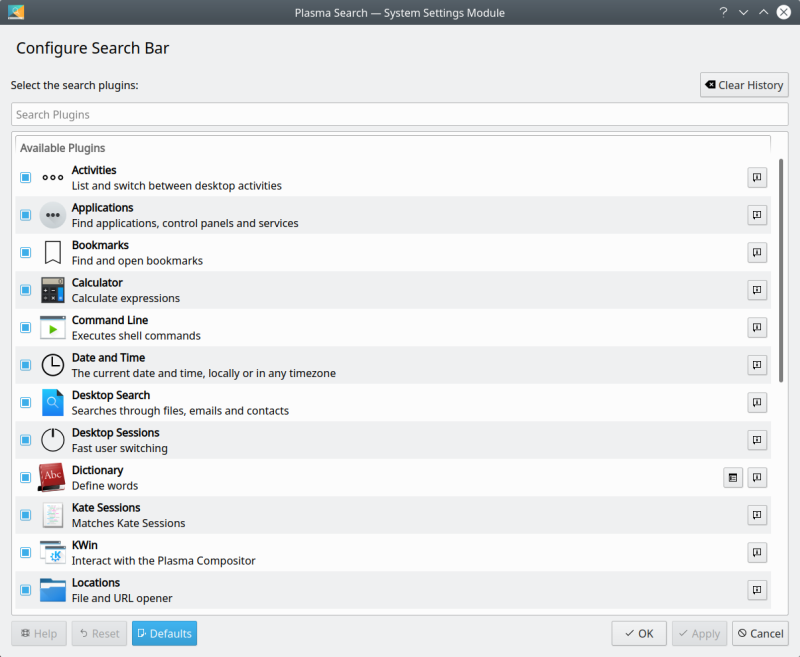 Plus, there was no difference between the default desktop and the do-not-track Activity. So something seems to be utterly broken, but then we've seen problems with Baloo in the past, so this does not come as a giant surprise, but it's still not acceptable. Not clear how to make exclusions here. And this is really bad. Because people could expect these features to work, so you could have your medical stuff or payslips or whatever private things you need stored in a Vault, and use them in a supposedly private desktop session, and then you do a file search while presenting to an audience in a meeting room, and it says you're HIV Aladeen or something. Well, that could be awkward. I mean Aladeen. At one point, I lost the system menu shortcut activation. The default Super key I use no longer worked, and the combo seems to have been changed to the default Alt + F1. I changed it back to my preferred Meta + F1, which is a hack, as it allows you to use Meta (Super) only without actually having to hit the other key, but this did not help. The only thing that helped was a full reboot - Plasma, Kwin and/or session restart did not work. Other than that, there wasn't much else to talk about this time. As you can see, we're slowly branching out, extending the tests, making things more complicated. A normal user would expect to take all these different scenarios for granted, and they wouldn't be wrong. In 2019, everything should be simple and straightforward, at least when it comes to computers. Oh the humanity. But Plasma does well. Bugs are going away, new ones aren't showing up in uninvited droves - yet - and there's ever so slightly more productivity across the application space. Solid hardware compatibility, as always. Some naughty bits and pieces too, like the Activities & privacy, and the menu reset. I am also surprised that there's so much stuff to learn and discover, still, months after I've configured the system. This isn't a bad thing, at all. 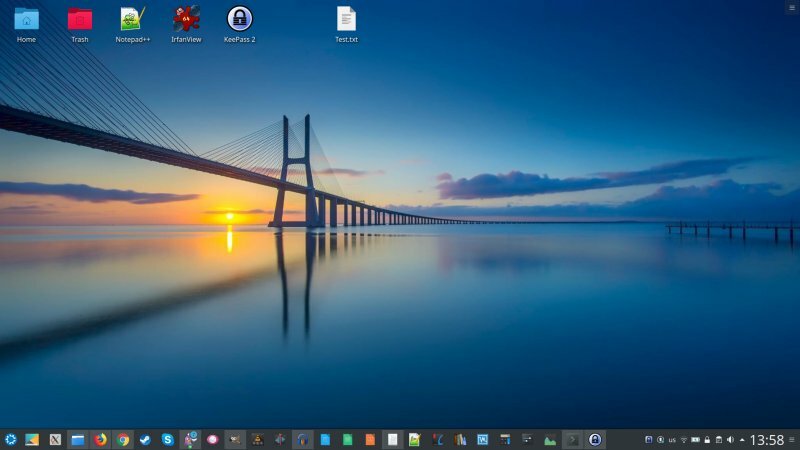 And just for comparison, while a similar journey on Windows 10, with a far more aggressive feature policy, feels painful, the gradual, gentle Plasma osmosis is the right kind of confidence and fun builder. You grow with your operating system. Well, thus endeth the seventh report. We still have many cool things to explore. Me likey. Stay tuned.